This recipe had its origins in how to get mayonnaise, ketchup, mustard, pickles, relish, and olives on a hamburger without having it all end up in your lap. The solution we came up with was to combine these all into a single sauce. This is great on hamburgers, but being a bit thinner than mayonnaise, it’s best if you spread a bit on each bun. It’s also great on hotdogs or sausages served in a bun. It also is great for vegetables that have been cooked on the grill, especially potatoes that have been sliced thickly and grilled until crispy on both sides. In fact, this sauce has a real affinity for potatoes of all kinds. It makes a tasty sauce for roasted potatoes, and can be added to a simple vinaigrette (one part vinegar, three parts oil) to make a unique dressing for potato salad. But it is at its absolute best as a dip for potato chips. It is simply amazeballs on thick-cut wavy potato chips. Once you’ve tried it, you’ll forget about all other dips. Blend everything together well and store in the refrigerator for at least an hour to allow the flavors to blend. You can use any kind of relish you have on hand: dill, sweet pickle, or bread and butter, which is my personal favorite. 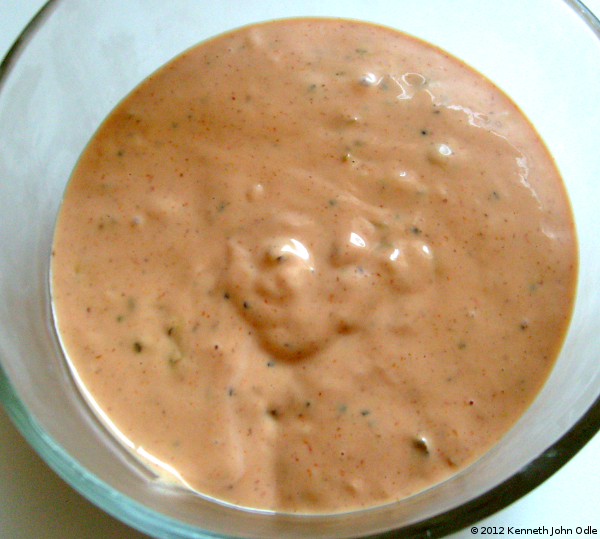 Use a fork to get it out of the jar, as you don’t want too much liquid thinning the sauce. Regular yellow mustard is fine in this recipe, although it does up the tanginess a bit. This is a good use for that posh French mustard you bought this spring. Dijon mustard works great, as does honey mustard. I like a coarsely ground spicy mustard. Just avoid mustards with whole mustard seeds in them. The texture doesn’t work well. You can also add a tablespoon or so of green stuffed olives, chopped finely (to about the same texture as the pickle relish) and drained on paper towels. Yum! « Summer’s here! It’s time for mayonnaise!